Two years ago, my good friend and wealth of inspiration of a human and creative Chris Martin launched Give-A-Day. He wanted to take a more active approach to living life with intention, purpose, and in making a difference in and for the lives of others. Last year I asked if I could join him (every wedding needs a photographer, too, right?! ), I was feeling adrift and knew that putting my heart and talent behind a cause that positively impacted my fellow humans would fill my heart. Which I desperately needed. It’s no surprise I was elated and ecstatic when he agreed to my partnering up on his beauty of a project. Christopher and I have joined forces yet again (can I get a HELL YEAH!) 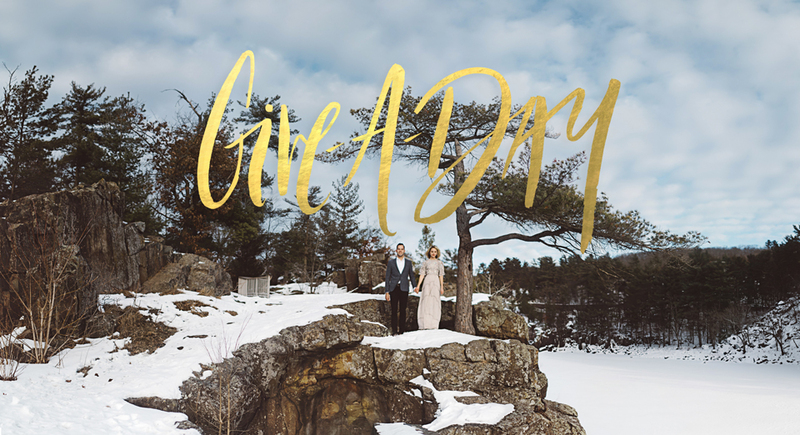 to give away a wedding film and photography package. We will meet with you, talk about your day, help with your schedule, shoot the day of events, edit the images and film into a beautiful, artistic story, and deliver it to you at no charge. First: If you’re not already, make sure you are following both myself and Christopher on Instagram. Third: Submit an inquiry via either of our websites (click here or here) letting us know when and where you’re getting married, which organization you’ll be donating your time to and why, and fill us in on your story. The more detailed and heartfelt and honest and candid (and all the other buzzwords) your story is, the better, as this year we’ll be selecting the winners based on the submitted story. (And be prepared to act! If chosen you must be willing to dedicate a full day of volunteering to the charity of your choice (8 hours per person/16 hours total). We will be asking for a copy of the completion document from your charity prior to your wedding day. First: You need not be local to Minneapolis to enter! We are (finally!) accepting entries from anywhere, and for a non-local winner will only require the winning coverage of travel costs. Second: Do you already have a photographer or cinematographer booked for your day? Fret not! You can still enter! Just let us know if you are submitting for only photography or cinematography and are not in need of both of us. The deadline for submissions is no later than 5PM Central Time, Monday, February 19th. The winner will be announced by Friday, February 23rd. On a more mushy note we reached our “OTP” status because we both were ballsy enough to one, admit we had dreams, two, believe in them, and three, be accountable to one another to go get’em. What’s more attractive than that? Deal sealed! Resilience is a trait we’ve both unknowingly mastered together. The journey has been a colorful one, and we would NOT change a thing about it! We met in a 4 year humanitarian training school, and withstood one entire year of an international long distance relationship. Upon reuniting, one of us started a battle with a life altering illness. As opposition continues to gust unforeseeable winds, we have never gotten better at planting our feet and curating new hope. So who is this couple that tried to compare their relationship to a celebrity-actor they’ll most likely never come into contact with? Whelp, Destiny is a whimsical, free spirit whose head is either on cloud nine, or just simply in the clouds… rarely in-between. She’s got a passion for the marginalized outcasts of society, and stays mesmerized by the positive, unique acts, humanity is capable of releasing. “Joe bro shmo” we call him, is a genuine-hearted visionary with an innate ability to make the unseen tangible, all while impressively living off of unhealthy amounts of coffee. He also possesses a soft spot for any puppy or baby animal. He daydreams of coral reef exploration, and deep sea cave diving. Travel is something we both believe is essential to growth, understanding, and mindfulness. We recently went to Nepal to shadow two people who are foreseeing locally sustained projects preventing all facets of human exploitation. From the city to remote villages every region unfortunately plays a part. We listened, reflected, and understood the evident need for education, social business, and community development. This type of work is something we strive to be a part of more and more, especially in our own local communities. Joe chose to propose in a remote village that was restored and thriving because of the efforts of these local organizations in Nepal. We were both humbled by the acceptance of the community and honored we could tell their story. Hopefully somewhere in here our bold accusation of our “squad goals” resembling “The Rock” makes more sense now. If not that’s gucci! We do hope we could stir up all the feels and get a few chuckles out of you. Thank you for the amazing opportunity to enter the Give-A-Day and for being AWESOME. We are getting hitched spring 2019 in Minneapolis, MN. We both live in Upstate, NY but Destiny’s hometown digs are in the #boldnorth! Destiny will be home this March 2018 to finalize the venue. We also have considered saying I-do’s in Ithaca NY, if you’d prefer to do something different and shoot in NY. We are open to that, as we would be more than happy to pay for your travel expenses. The Potter’s Hand Foundation – Nonprofit/safe house committed to serving survivors of sexual exploitation and trafficking. Food Bank of the Southern Tier – A local food bank, working to build and sustain hunger-free communities. Tanner’s P.A.W.S – Protecting animal welfare and safety through rescuing, sheltering, adoption, and, education.